Juicing wheatgrass correctly requires pulping it, and excessive exposure to heat can damage the juice and limit its nutritional benefits. Finding the best juicer to produce this versatile yet delicate product is key. 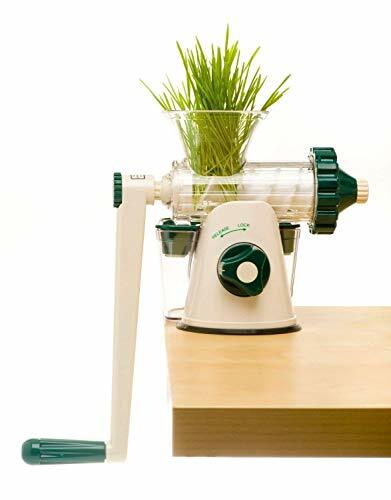 Our pick of the bunch is the Handy Pantry HJ Hurricane Manual Wheatgrass Juicer. This countertop-mounted manual unit is purpose-built to handle wheatgrass and produces juice at a faster rate than most of the other manual units. It’s simple to use and easy to clean. In this guide, we will cover what to consider when buying a wheatgrass juicer and compare models in our wheatgrass juicer reviews. Why Buy A Wheatgrass Juicer? The benefits of wheatgrass juice consumption can be remarkable. Wheatgrass juice is made of up to 70% chlorophyll and is an ideal source of vitamins A, C, and E, and offers minerals including magnesium, potassium, calcium, iron, and phosphorus. Wheatgrass is often available at farmer’s markets and health food stores. You can also grow wheatgrass at home in water; however, it needs some tending and rinsing to encourage sprouting. Once sprouted, it will grow simply by keeping it moist with a spray bottle. Wheatgrass is best juiced in a masticating or cold press juicer, rather than a centrifugal juicer that uses a fast spinning blade. Masticating juicers are slower but produce less heat and cause less damage to the wheatgrass, leaving more antioxidants in your juice. Additionally, wheatgrass juice made in a centrifugal juicer will need to be strained, whereas masticating juicers separate their own pulp. Masticating or cold press juicers can process both hard produce and fresh leafy greens, including wheatgrass. The Lexen GP27 was designed and developed by people specifically for juicing fresh greens. The design is effective for juicing not only wheatgrass but other leafy greens including spinach, kale, and lettuce. Getting fresh greens to release their most healthful benefits requires the juicing process to be cool and slow. The heat of whirring stainless steel blades will destroy many antioxidants and enzymes before you get to drink them. Single-crank auger grinds greens slowly to produce fresh vegetable juice loaded with antioxidants. Dual mechanism affixes this juicer to your countertop from above and below. Quick disassembly and easy clean-up reduces your labor time. The countertop clamp requires a deep grip, so if you have shallow countertops, this tool may need to be used on a table instead. The Lexen GP27 is made in China; if you have concerns about leads or toxic plastics, do your research. Some wide greens such as spinach wind up wrapping around the auger. You may need to feed these greens with a more fibrous vegetable. The slow masticating process of the single auger crank used by the Lexen GP27 juicer means that you’ll get the full health benefit of your fresh greens. This juicing tool mounts to your countertop via two methods: the screw clamp manually sets the juicer in place from below and a suction cup can be locked down from above. One of the extra benefits of manual juicers is that you get an arm workout as well as a healthy vegetable supplement. Thanks to the dual mounting mechanism, you won’t have to chase the juicer as you grind. The produce shoot offers a flared top so you can stand your greens up and let gravity feed them down into the auger as you crank. The Hurricane Manual Wheatgrass Juicer is made of 100% stainless steel, saving you from concerns about plastic toxins or rust. 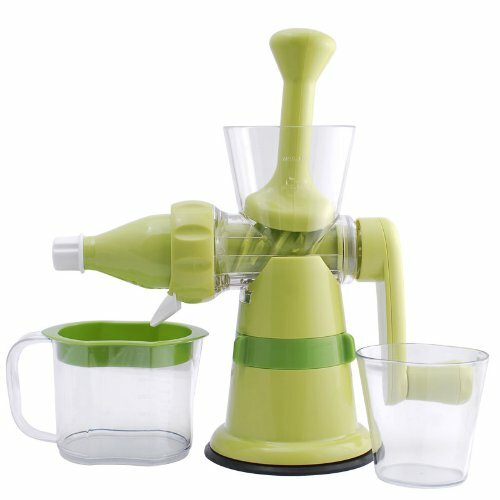 The body of the juicer is formed as a single unit, from the flared greens hopper to the sturdy, wide feet. The counter clamp of this tool can accommodate a depth of over two inches, so you can juice on your breakfast bar if you like. The cranking shaft is fairly short, so you can juice from a sitting or standing position. This stainless steel unit will last for years and produce plenty of wheatgrass juice. The counter clamp is formed into the body of the juicer; no worries about this mechanism failing over time. 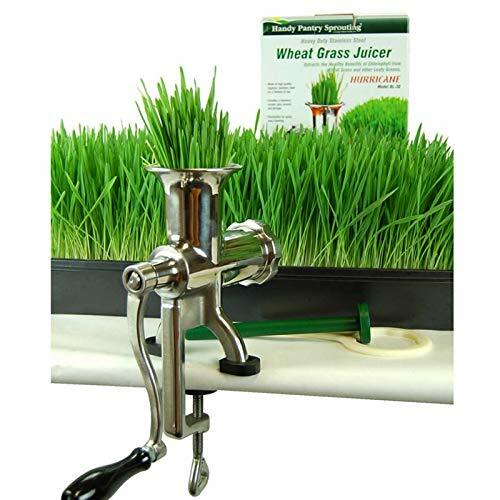 The flared hopper will keep your wheatgrass upright as you grind. The cranking shaft is quite short and takes some hand and arm strength to get it to move. The counter clamp requires a deep “bite” and a lot of overhang. Might have better luck working on a table. The mesh screens that come installed in the machine may not work properly. Because the Hurricane is cast as a single unit, cleanup is extremely simple. The entire unit can be washed in the dishwasher. Simply remove the spout and screen and extract the pulp, then wash and dry all moving parts. If the pulp is very wet, you can run it through again to extract more juice. This juicer is fairly short; you’ll need a container to catch the juice that can fit easily under the spout and catch any and all juice drips. Many users suggest a bowl so no juice is wasted. It should be noted that this juicer is best used for wheat grass. Tough, fibrous vegetables will not pass easily through this model, and many vegetables like celery may wrap around the auger. If you would like to juice apples, carrots or other fibrous produce, an electric juicer may be more effective for you. The Tribest Z-510 is a very lightweight and portable juicer that can handle small pieces of fibrous produce, including carrots and apples as well as fresh greens. Wide leaves, which can be a challenge in some juicers, are easy to juice in the Z-510. The Z-510 cranks easily and juices greens beautifully. This masticating juicer can handle greens as well as small chunks of fibrous produce. This juicer travels easily and weighs less than four pounds. While the Z-510 claims to have an effective counter clamp, it’s not visible on the packaging. There are metal components that need to work against gears formed in plastic, so parts of this tool may strip out over time. The plastic around the juicing screen may crack under pressure. The majority of this unit is built of BPA-free plastic, and any parts that come in contact with produce are either BPA-free plastic or stainless steel. The pulping and pressing process is very efficient with this tool and it does a great job of extracting plenty of juice. While the body of the tool is primarily plastic, the auger is made of melamine plastic with a stainless steel rod at the center. This juicer is easy to disassemble and clean. All parts of the Z-510 can go into your dishwasher for an easy cleanup. The only non-manual juicer in our top five review list, the Omega Nutrition Center is well-designed to handle leafy greens and wheatgrass, doing a great job at extracting the maximum amount of juice. Well-suited for those either with large families or requiring copious amounts of juice, this electric juicer will save you the physical effort involved with the other manual, crank-operated models. Quiet operation compared to other electric juicers. Juicing parts are dishwasher safe. Can be used to make nut butter, pasta, grind coffee and spices and much more. Expensive in comparison to manual juicers. Some essential parts are made of low-quality plastic and may break easily. The small feed chute entails fine cutting up of fruits and vegetables. With a super slow speed of only 80 RPMs per minute, you can be assured that the nutritional value of your wheatgrass won’t be compromised by heat or oxidation. This unit does a good job of extracting the maximum amount of juice, leaving a dry pulp; you shouldn’t have to feed it through a second time, unlike some of the other reviewed units. Bear in mind that even though the Omega is powered by electricity, it isn’t designed to go fast (in order to preserve all the goodness passing through), so don’t expect it to match the speeds of centrifugal juicers. It’s really easy to assemble, take apart and clean, taking less than a minute for each of these processes. 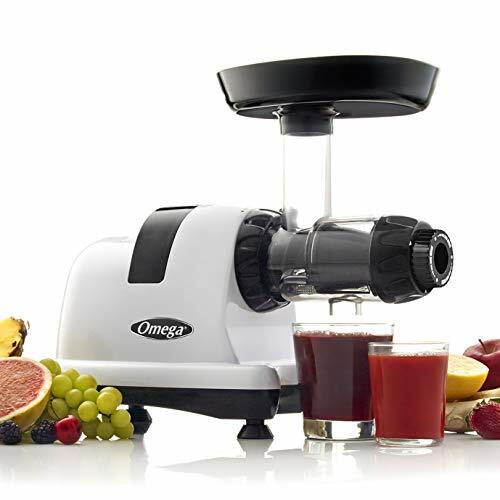 One major concern we have with the Omega Nutrition Center Masticating Juicer is the questionable quality of some of the most integral components; the auger, the cone that fits around the auger, and the screen are all made of plastic. The auger may break or wear down quite rapidly, along with the essential cone that fits around it. Along with this, the juicing screen is rather fragile and may break or snap. These parts are neither easy nor cheap to replace and the machine can’t function without them. Given the price of this unit, we recommend giving it some serious thought before purchasing. If you’re really unable to utilize a manual juicer for your wheatgrass, then this may be just what you’re looking for, with the added bonus of its wide range of functions outside of juicing wheatgrass. This humble little juicer looks basic and comes at an absolute bargain price, so you may well wonder if it does the job it claims to do. 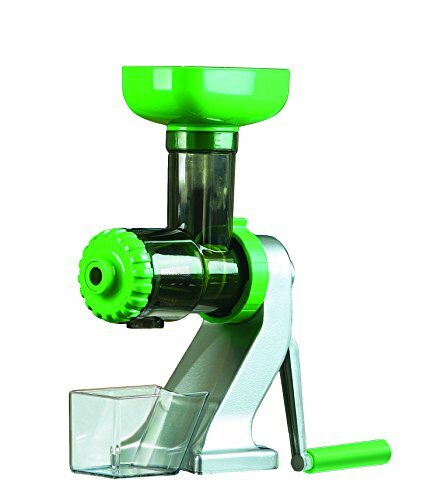 Happily, the Chef’s Star Manual Hand Crank Juicer is an effective little unit which indeed can produce some decent juice from your wheatgrass – albeit a little time consuming. One of the biggest advantages of this juicer is its compact size and portability. Can’t live without your juice when camping, in the office or traveling? No problem, it’s sturdy enough yet light enough to throw into your bag and take with you. Strong and simple plastic construction is easy to assemble and clean. Portable and can be used anywhere. The suction feet can be tricky to affix firmly. Requires a considerable amount of physical exertion. Takes some time to produce enough juice. This unit is great for those who don’t have the time or patience for tricky devices or lengthy cleaning; it’s oh so easy to assemble or disassemble and cleaning is a breeze. There are no small, fiddly components to worry about. Although we’re not sure this juicer would do a great job with hard fruits or greens like kale, it does handle wheatgrass well. You will need to feed only a small amount through at a time and it will work better if you cut it into one-inch lengths. The pulp may come out a little wet, so you may need to run it through another one or two times to get all the juice out. A problem some users have is the suction feet at the base. With certain surfaces or under certain conditions, the unit may not affix firmly to the countertop and you’ll struggle to hold it still while exerting enough force to crank the handle. All in all, for the price, this is a great little juicer which is ideally suited for someone wanting to give juicing a try to see if it’s right for them without investing too much money – or perhaps the occasional juicer. The amount of physical work required to obtain a small amount of juice may make this an unsuitable choice for a frequent or heavy-duty juice fiend. If wheatgrass is worth drinking, it’s worth capturing all of the health benefits, and that means using a slow grinder. The Handy Pantry HJ Hurricane Manual Wheatgrass Juicer is our favorite model. It will produce nutrition-packed juice without pulp while reducing oxidation. It is well constructed with no cheap parts and should be durable and long-lasting. Best of all, the Handy Pantry manages to extract all the juice on the first run through, saving you time and effort. Investing in an electric juicer can be hard on your budget, but a manual juicer takes time and dedication to master. Consider how much wheatgrass juice you want to consume and how often, and choose a model that fits your needs.